A-HOTEL.com - Luxury and cheap accommodation in Bezhitskiy Rayon, Russia. Prices and hotel, apartment booking in Bezhitskiy Rayon and surrounding. This hotel is set on the main Lenin Square. Free Wi-Fi and a 24-hour reception are featured at Hotel Desna. Hotel Tsentralnaya is located in the centre of Bryansk, right on the main square. It is set in a historical building, and features a gym and a sauna. Apartment Center on Fokina 65 is set in Bryansk. Guests staying at this apartment have access to a fully equipped kitchen. Situated in Bryansk, Dinamo Bryansk has a fitness centre, bar and free WiFi. The accommodation provides a 24-hour front desk. Rose Apartment is set in Bryansk. This apartment also features free WiFi. Located in Bryansk in the Bryansk region, комфортная квартира has a balcony. Guests staying at this apartment have access to a fully equipped kitchen. Boasting accommodation with a balcony, Apartment on Sovetskaya is situated in Bryansk. Guests staying at this apartment have access to free WiFi and a fully equipped kitchen. 37 улица Дуки is set in Bryansk. Complimentary WiFi is provided. Apartment na Lenina is located in Bryansk. Guests staying at this apartment have access to free WiFi. 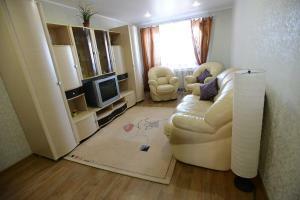 Boasting accommodation with a balcony, Apartment on Emlutina 44 is situated in Bryansk. Complimentary WiFi is featured. Situated in Bryansk, Apartment on Prospekt Lenina 10 provides free WiFi, and guests can enjoy a garden and a terrace. Each unit comes with a fully equipped kitchen with a dining table, a flat-screen TV and a private bathroom with bath and free toiletries. Offering free WiFi and city views, Apartments on Duki is an accommodation located in Bryansk. Guests have a private balcony.